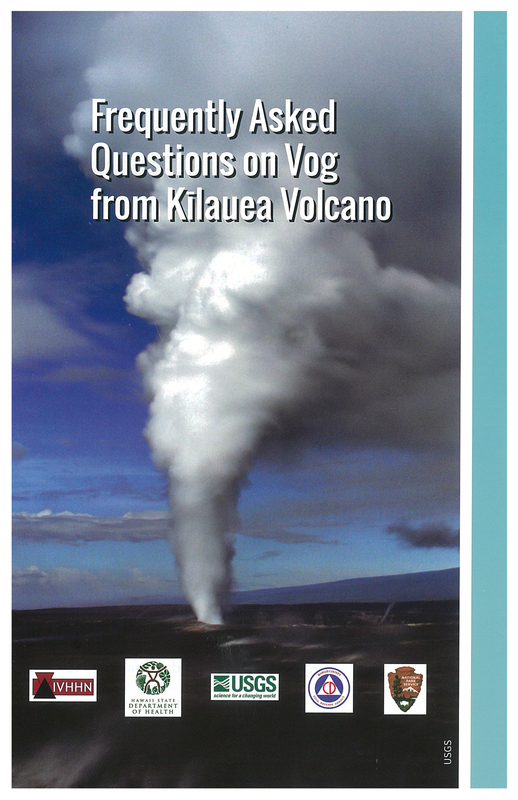 This booklet, “Frequently Asked Questions on Vog from Kīlauea Volcano,” is just one of the new information products now available online (ivhhn.org/vog/vog-fact-sheets) and in print. These products and the “Hawaii Interagency Vog Information Dashboard” (ivhhn.org/vog/) provide information and strategies for adapting to life with volcanic air pollution in Hawaii. As winter approaches, many Island of Hawai‘i residents eagerly await the appearance of sub-tropical snow atop Mauna Kea and Mauna Loa. Another common occurrence on Hawai‘i Island during winter months is the frequent interruption of the steady northeasterly trade winds. These winds, or the lack of them, play a leading role in determining where volcanic air pollution from Kīlauea, known as vog, is distributed across the island, and sometimes the state. Vog, caused by sulfur dioxide gas (SO2) emitted from Kīlauea, has been a frequent problem on the Island of Hawai‘i for the past 30 years. Since the onset of the summit eruption in 2008, there has been a dramatic increase in the amount of SO2 and other gases released from the volcano and in the damaging effects of vog on the island. From May to September, trade winds blow 80-95 percent of the time, but from October to April, the frequency drops to 50-80 percent. On Hawaiʻi Island, the districts of Ka‘ū and Kona bear the brunt of vog during northeasterly trade winds. But when trade winds are absent, areas impacted by vog can include East Hawai‘i, the whole Island of Hawai‘i, and, at times, the entire State of Hawaii. For this winter’s vog season, new resources are available to help people become familiar with, and minimize their exposure to, vog. A new internet-based “Hawaii Interagency Vog Information Dashboard” (ivhhn.org/vog) provides a user-friendly starting point to search for information about vog. 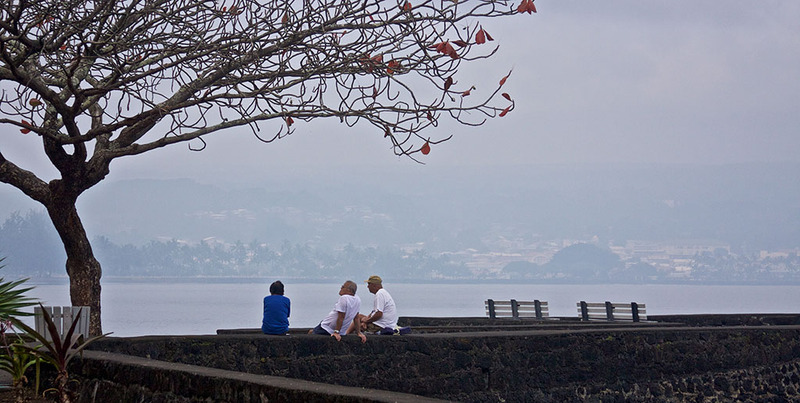 Topics on this dashboard include vog forecasts, real-time vog concentrations, health effects and environmental impacts of vog, and how people can protect themselves from vog, as well as links to published scientific literature. The dashboard also leads users to a new suite of concise vog information products. These products, which include a booklet of frequently asked questions and a brochure and poster on protecting yourself from vog, are available online (ivhhn.org/vog/vog-fact-sheets), where they can be viewed or downloaded. Print copies of these vog information products are available through the Hawai‘i Department of Health District offices. They are also in the process of being distributed to public libraries and schools around the Island of Hawai‘i. If you’re interested in how your neighbors cope with vog, check out these new products, as they incorporate information and protection strategies gathered through community surveys in 2015. The surveys, which were conducted by an international researcher in cooperation with the USGS Hawaiian Volcano Observatory, examined the strategies used by Hawai‘i Island residents who live with vog, and how those people would like to receive information and guidance about vog. Vog shrouds the coastline of Hilo Bay as seen from Liliuokalani Gardens Sunday morning (Jan 17, 2010). Photography by Baron Sekiya | Hawaii 24/7. If you’d like to know when vog might be in your area, a dashboard link takes you to “vog and wind forecasts,” which includes the University of Hawai‘i at Mānoa “Vog Measurement and Prediction Project” (weather.hawaii.edu/vmap/). This vog model provides an animated two-day forecast of SO2 gas and sulfate particle concentrations for the State of Hawaii. Many people find this forecast useful for planning outdoor activities to minimize their exposure to vog. As SO2 travels away from Kīlauea Volcano’s eruptive vents, it is gradually converted (through chemical reactions in the atmosphere) from a gas to solid particles and liquid droplets. So, in areas close to the vent, SO2 gas is a component of the vog. But in areas distant from Kīlauea, like West Hawai‘i or on other Hawaiian islands, vog is composed of particles, with virtually no SO2 gas in the mix. The Hawaii Department of Health “Hawaii ShortTerm SO2 Advisory” (hiso2index.info/), which provides data on current SO2 gas levels, is extremely helpful for areas close to Kīlauea. But for West Hawaiʻi (Kona) residents, the more relevant particle information is available through the vog dashboard link to “AirNow particle data” (ivhhn.org/vog/current-air-qual…). Gas emissions from Kīlauea have decreased somewhat since the summit eruption began in 2008, but vog continues to challenge Hawaii communities, causing impacts to health, agriculture, and infrastructure. Learning how to identify when vog is in your area, and how to protect yourself and your family when necessary, are adaptations to living with the remarkable volcano in our backyard. Hopefully, the new information products and online dashboard will help Hawaiʻi residents to understand and adopt strategies for living more comfortably with vog.